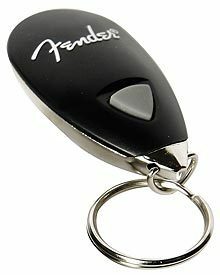 Whether we're playing a Stratocaster, Precision Bass or the classic amps from Fender, we guitarists have a deep respect for the revered brand and its storied instruments, and now we can wear that logo on a key fob with the Fender Keychain Tuner, a strobe-light guitar tuner that doubles as a bottle opener. Shine its strobe light on a guitar string, crank around the tuning pegs, and when that string appears to stop vibrating, it's in tune. If you have a great ear and can tune the guitar yourself, use the thing as a flashlight, or give it to one of your bandmates as a subtle hint alluding to his questionable intonation. It's 10 bucks.